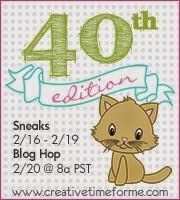 Liz's Paper Loft: MCT February Sneak Peek Day 2 ~ you're purr-fect! Good morning and welcome to day 2 of My Creative Time's February Release Sneak Peeks! So after seeing yesterday's sneaks, whatcha think? Stinkin' cute, right?! So I'm pretty sure you won't be disappointed with today's sneaks! To create the little pictures, I used the dies, popping out the square and watercolored it. Then I added the bones, kitty, and paw...super cute! :) They're from the new set You Had Me At Meow! 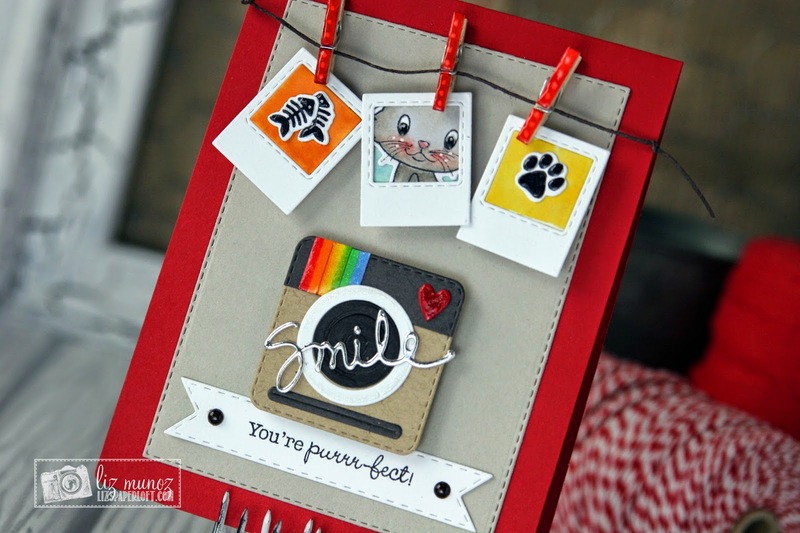 Picture Perfect Stamp and Die Set ~ pictures, camera, "smile"
Thanks for sharing your cute card. Love the pictures. Love the Snap shot layout on this card! What a darling set to create with! Such a lovely card! Love the little photos and the kitty one is my fav! OMG Are You Kidding Me? Your card is Fabulous and oh so much Fun!! WOW talk about being super clever and creative WOW!! Love your idea of the hanging pics OMG amazing..you have totally left me in awe of what you did...Love how you've used all of Miss Emma's goodies thanks for your fantastic ideas. Oh my goodness, this is the cutest, most cleverest card ever! I love all the little polaroid snapshots. Too cute! Very creative! Love how you incorporated some of the other sets to come up with this fantastic idea! Adorable! Oh my goodness. What fabulous details you made into this card. The little pictures you created and hung from the string with clothespins are just amazing. OMG, this is just AWESOME!!! I absolutely LOVE this card, Liz!!! Clever idea. Have to remember this one for future cards. This is so so cute!!! I LOVE the kitties!! So creative....this is my fav today for sure!!! OMG!!! So FABULOUS....Love this card. Your card is very cute. This little kitty is cute. What a completely adorable idea!! LOVE Love Love this!!! How creative to use the Picture Perfect set along with this new kitty set!! Love everything about this card!! Super cute, love the little photos and the kitten! This card is so stinkin' cute! I love the little snapshots. Great work. Your card is so super cute! I love the little polaroids!!! OMG Liz, this card is amazing, love all the polaroids! The polaroid idea is cool and creative. i can't wait to see all of the stamps in the set. i love the little fish. Hi, I went 2 your vides & saw d cutest card ever. It was a get well card w/vintage ladies stickers, went 2 d website indicated in ur video & couldn't find d mentioned stickers. Can u plz guide me on this? Greatly appreciated it. just adorable card, in beautiful and awesome colors! Ooh, what a fun card/design Liz! The snapshots are so cute and love the darling line and pins...so fun! What a fun card! Love the snapshot idea with the camera. ADORABLE! 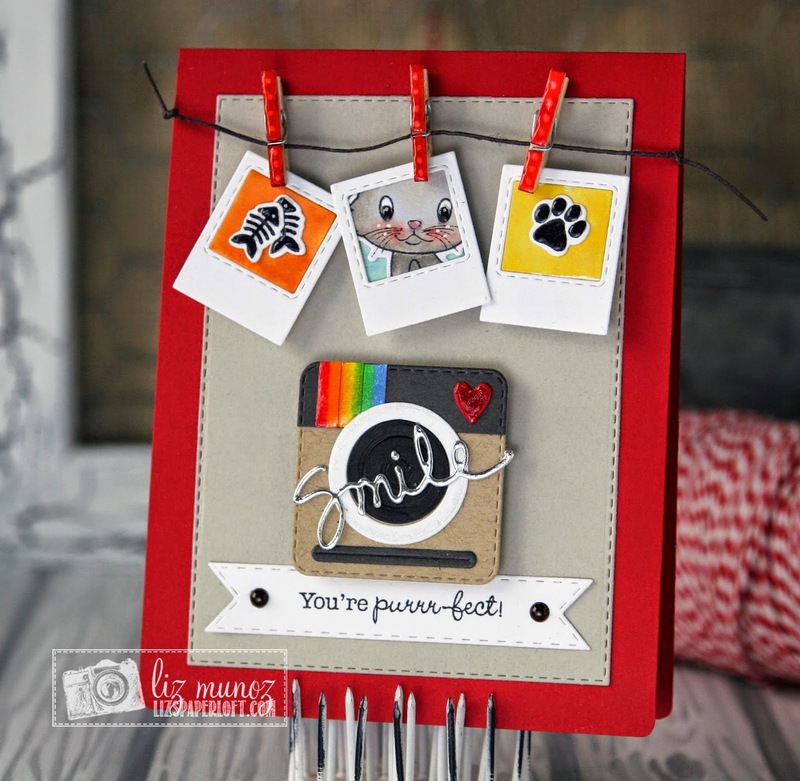 I love how the mini photos fit on your card like a dark room...what a super fun idea! The kitties are so adorable and the sentiments are cute. I can't wait to see them all. Wonderful job on your sweet card. I love your card its sooo dramatic!!! Fun card with those cute little pics and clothespins! Love that adorable kitty! I think this is one of my ALL time FAVORITE cards from you! How super ADORABLE and creative is this!!!!! LOVE it Liz! Awesome job!!! I love how you made this card, it's totally perfect!! This card is awesome! Love it! So clever! OMGOSH Liz ~ I call dibs!!! I LOVE, LOVE, LOVE this card ~ Oh my word! How CLEVER of you to use these dies for the kitty stamps and dies ~ EEKKK! PURR~FECT!! !